On a beautiful sunny morning, May 21, 2015 when the Orthodox celebrated Ascension Day and Sf. 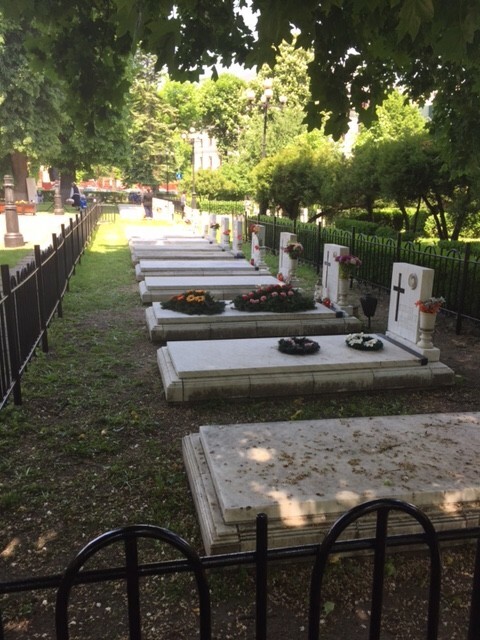 Elena, we walked in the beautiful park downtown Brasov set at the foot of Timpa Peak, where a crowd had gathered in front of a large cross and several tombs of the young men and women killed on December 22-26, 1989, during the Revolution that toppled Ceausescu’s brutal communist regime. Some of them came to a rally and some were simply walking through the park. Shots rang out from many directions, mowing down those unfortunate enough to be in the path of the stray bullets. As many as 46 people were shot within ninety minutes. Two large flower wreaths were placed in front of the cross in their eternal memory. I interviewed Mircea Brenciu, member of Uniunea Scriitorilor din Romania (Writers’ Union) and spokesperson for Asociatia Revolutionarilor din Brasov (Association of Revolutionaries from Brasov). 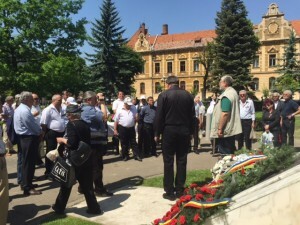 Brenciu gave a fiery speech to the crowd of mostly middle-aged men who had gathered on Ziua Eroilor (Heros’ Day) to pay respects to those who died for freedom, freedom that had been squashed in Romania during more than four decades of communist terror. 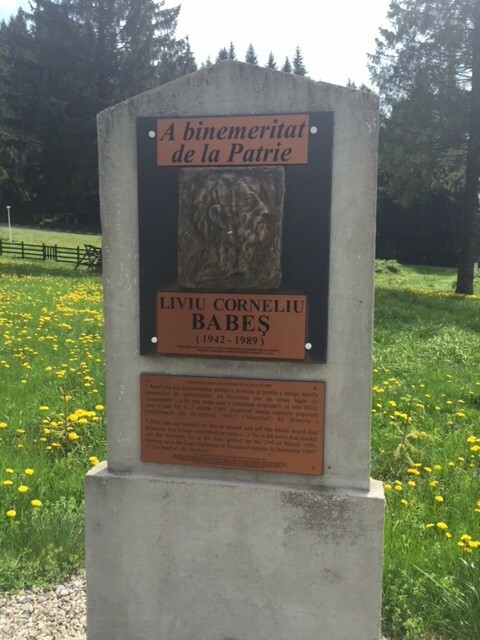 The Association of Revolutionaries had asked City Hall repeatedly for a monument to honor the sacrifice of those who gave their lives in December 1989 in this park and elsewhere. In his opinion, disrespecting history is one of the many reasons that have determined the miserable state in life of Romanian citizens in general. Conditions have improved, he said, Romanians can go abroad to work, they can speak freely, they can travel, they can curse the regime freely, but nobody is listening, Brenciu added. Prices rose to the European Union levels since 2007 but salaries are still “10-15 times smaller.” Austerity measures imposed by the EU have compounded the problem. “How can a Romanian citizen survive under these conditions,” he asked. We have become the beggars of the European Union even though our country is very wealthy in natural resources that have been sold out to foreign investors to benefit the ruling elite class while Romanians struggle to make ends meet. “Poverty is glaring, nobody has any money. Doctors ask for bribe money (even though the medical system is socialized and generally free), officials ask for bribe money, food is extremely expensive, how can one live in a country that freed itself from communism? Most people are still afraid to go to the doctor even for simple operations. Many good doctors have fled to the west for better pay and working conditions and, for a while, young people chose other fields of study. Who wanted to work so hard to become a doctor when they made the same paltry salaries like everybody else? I asked about the average college graduate pay and I was shocked at the answer, $300 per month. And unskilled workers in America demand an economically impossible living wage of $15-20 an hour. Romanians have told me that dental care is very expensive and the quality of work lacks a lot to be desired. Few acquire the expert training of dentists in the U.S. Socialized medicine is a disaster, slightly better than during Ceausescu’s regime. Retirees are compensated at the 50 percent rate for the first three prescriptions; after that, they must pay full price for any additional drugs they need. 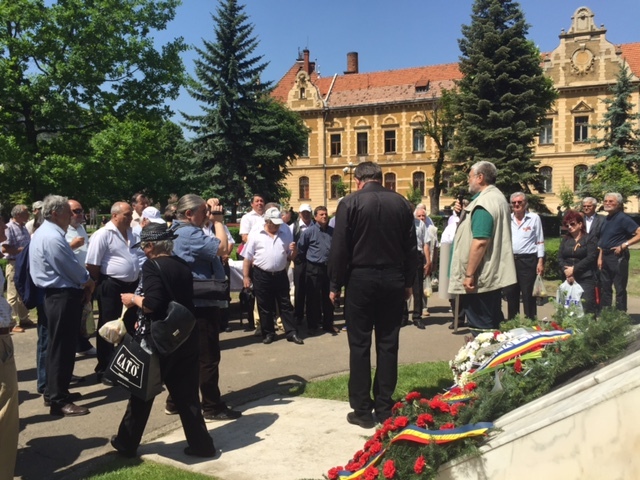 Forgetting and rewriting history is not occurring just in Romania, it is a wave happening around the globe, a groundswell of global revisionist curricular history smacking of communist indoctrination. “Globalism is a form of anti-nationalism, with the idea of forming a unique global state, a utopia that begs the question, who is going to run this global state, who is going to establish the rule of law, what is going to happen to the principles of democracy? As long as there are nations, there is equilibrium and respect between countries, a tradition and history that balance out a social equilibrium. European Union is a first step of this globalization. Why is the EU abandoning us while exploiting the country for everything possible for their personal gain,“ asked Brenciu pointedly. 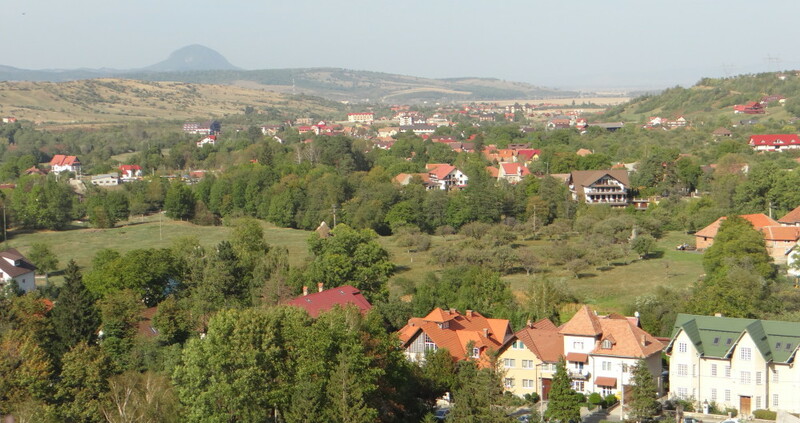 Brenciu talked about Rosia Montana mine exploration in the Apuseni Mountains of Western Transylvania, which is currently blocked, and its vast reserves of gold, rare earth minerals, and rare metals such as wolfram (tungsten), vanadium, nickel, manganese, which are more valuable than gold. Gabriel Resources of Canada is planning to reopen the currently blocked gold mine which has been closed since 2006. Brenciu alleged that over $120 billion have been stolen since the fall of communism, enough to bring Romania to an economic development on par with the EU countries. This calculation, Brenciu stated, was based on Dr. Ilie Serbanescu’s opinion as an economist, academician, and Former Minister of Reform. The money that was stolen is now in foreign accounts, Brenciu said, while the country survives in dire economic needs. 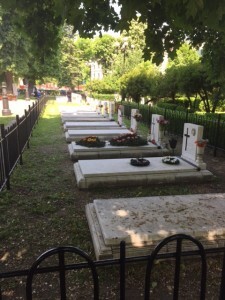 “It was carnage, people were mowed down, and there was blood everywhere and screams of pain coming from the injured.” It is inconceivable to be the mayor of this town that has sacrificed so much for the Revolution and to refuse a monument to commemorate this profound event, I do not and cannot understand,” Brenciu added. On November 15, 1987, in this same park, workers came out of factories to protest and took down Ceausescu’s “Dear Leader” portrait from Cladirea Prefecturii (the Prefect’s Building). Everybody was of course arrested and their fate unknown since they were dispersed around the country and held in the many political jails Ceausescu had built or opened. I discovered one such jail at Cetatea Fagarasului, located in a 15th century fortress, cold, damp, and mildewed from standing water in the basement. The solid rock construction made the interior considerably colder than the exterior. Before the Iron Curtain fell, on March 2, 1989, a citizen from Brasov, Liviu Corneliu Babes (1942-1989) skied down the mountain in Poiana Brasov. Wearing a sign protesting Ceausescu’s vicious regime, he told the whole world that Romania was a communist Auschwitz and then set himself on fire. I journeyed to Poiana Brasov to pay respects to Babes. A plaque commemorating his sacrifice (and erected by Mircea Brenciu and his organization) stood next to a small wood church. I went inside to pray for him and for my Dad and I encountered a young priest. I asked him about Liviu Babes and he let me know in direct language that the church considers him an apostate because suicide is not condoned. But his next words shocked me even more. He said that the church teaches the parishioners to obey the state and the government at all costs. I tried to reason with him by asking what he remembered from Ceausescu’s regime. This priest was barely 5 years old when Ceausescu was executed. He told me that he remembered long lines with his mom trying to buy food on rationing coupons, otherwise, he said, it was fine. I left speechless. His washed brain and twisted view of reality clashed terribly with historical facts. It is a shame that there is no monument where one can pay their respects and light up a candle to the memory of those who fought against communism. 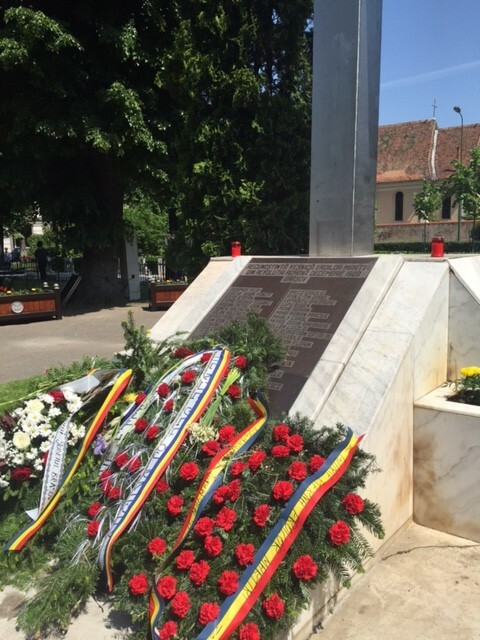 Brasov gave their heroes who sacrificed for the European fight against communism. It is shameful, “people who don’t respect their past, have no future,” Brenciu explained. “I have a fear that we are going to lose our country,” Brenciu concluded. “I only see one solution, to bring back the institution of monarchy.” The people are disoriented and discouraged, he explained. “The biggest theft occurred under the ten-year rule of President Traian Basescu.” The Revolutionaries are supporting the new President, Klaus Johannis, the former mayor of Sibiu, but his success depends on the political class. Right now the country is terribly divided. There is a saying that goes, “Our country is so beautiful, it is sad that it is inhabited.” We have so many simple and uneducated people who are easily manipulated by the mass-media, they are voting for the wrong people who control, lie, cheat, and steal. In exchange for a vote, bribes of 5, 10, 15 euros are paid and accepted. Days after the interview I was mulling over the similarities between the fate of our countries in terms of purposeful destruction, curricular indoctrination, moral bankruptcy, banking corruption, crony capitalism, disinformation of the voting populace, and the endemic corruption of the ruling elites. 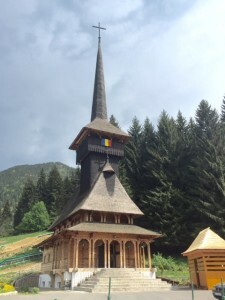 This entry was posted in travel and tagged Brasov, heroes, Liviu Babes, Mircea Brenciu, monument, Poiana Brasov, rally, Revolution, Romania, tombs, wood church by Admin. Bookmark the permalink.